Montana is the 4th biggest state in physical size but has the 8th smallest population overall. This means that Montana’s population is very sparsely spread out. The relatively low population of Montana is partly due to the fact that around half of the state is filled with vast mountain ranges like the Rocky Mountains, with this kind of terrain making the development of settlements and cities quite difficult. Mountains make up most of the western side of Montana, while the eastern side is home to prairies and badlands. Montana measures up at over 147,000 square miles in total and is home to a population of over 1 million people. Nicknames for this state include 'Big Sky Country' and 'The Treasure State', and tourism is one of the biggest contributors to the Montana state economy due to the fact that this state is home to many beautiful national parks and natural areas like Glacier National Park and Yellowstone National Park. The state capital of Montana is Helena, but its most populous city is Billings. Continue for more information on Billings, Montana, and the other large cities of this state, complete with approximate populations for each city and brief overviews of each location. Billings is the number one city in Montana, it’s located in the southern central part of Montana in Yellowstone County, of which it is the county seat. Billings measures up at around 43.5 square miles and has an approximate population of around 109,000 people, with over 170,000 living in the surrounding metropolitan area. This city has a history dating all the way back to 1877 when it was founded, in the Yellowstone Valley, by a lawyer and landowner named Frederick H. Billings. The city of Billings has played an interesting role throughout history, especially back in the days of the Old West as one of the early railroad towns. Thanks to the power of the railroad, Billings earned the nickname 'Magic City' as it saw a lot of rapid development and growth. Nowadays, it's the main financial and cultural hub of Montana and is home to some interest theaters, live entertainment venues, museums, and special annual events like Skyfest and the Montana Fair. 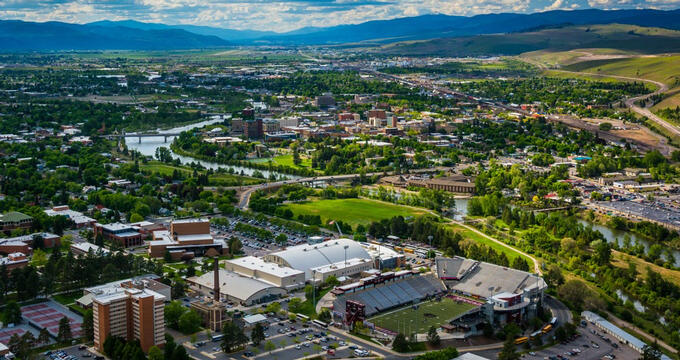 Missoula is the 2nd largest city in Montana. It's located in Missoula County in the west of Montana and is actually the county seat. Missoula measures up at around 29 square miles, but its metropolitan area extends to over 2,600 square miles. This city is home to around 73,000 people, with a total over 117,000 when taking into account the entire metro area of Missoula. Missoula was founded in 1866, but was the site of human habitation for many thousands of years before the European settlers first arrived on American soil. It was actually the famed Lewis and Clark Expedition that helped to put this city on the map, with the expedition stopping twice in the Missoula area. The city of Missoula has been nicknamed 'Garden City' due to its many parks and green spaces, with around 400 acres of parks and 5,000 acres of conservation land in total. Great Falls is the third largest city in Montana. This city is located in Cascade County, of which it is the county seat, in the central-western part of Montana. Great Falls covers an area of a little over 22 square miles and is home to around 58,000 people, with over 82,000 in the metro area. Founded back in the 1800s, the area that would eventually become Great Falls was inhabited by Paleo-Indians thousands of years ago and was actually visited by Merlwether Lewis as part of the famous Lewis and Clark Expedition in the early 19th century. The city is named due to the fact that several waterfalls on the Missouri River basin can be found nearby. Great Falls is home to various museums, education institutions, and plenty of parks and natural spaces. Bozeman is the 4th biggest city in Montana. This city is located in the southwestern section of Montana in Gallatin County. Bozeman is the county seat of Gallatin County and measures up at 19 square miles in area, being home to an approximate population of 46,000 people, with over 100,000 in the full metro area. The area that would become Bozeman was visited by William Clark of the Lewis and Clark Expedition in 1806, but the city wasn't founded until the 1860s when a pioneer named John Bozeman opened up a branch on the Oregon Trail called the Bozeman Trail which led through the Gallatin Valley, where Bozeman would be founded a short while after. Butte is the 5th biggest city in Montana. this city is located in Silver Bow County, of which it is the county seat, in the southwestern part of Montana. Butte stretches out across more than 700 square miles of land due to its status as a consolidated city-county and is home to around 33,000 people. Butte has appeared in a lot of films and TV shows over the years and is perhaps best-known as being the hometown of world famous daredevil Evel Knievel. Some of the films in which Butte has appeared include The Killer Inside Me and Runaway Train, and the city is also known for its beautiful historic district and for being the home of Montana Tech university.